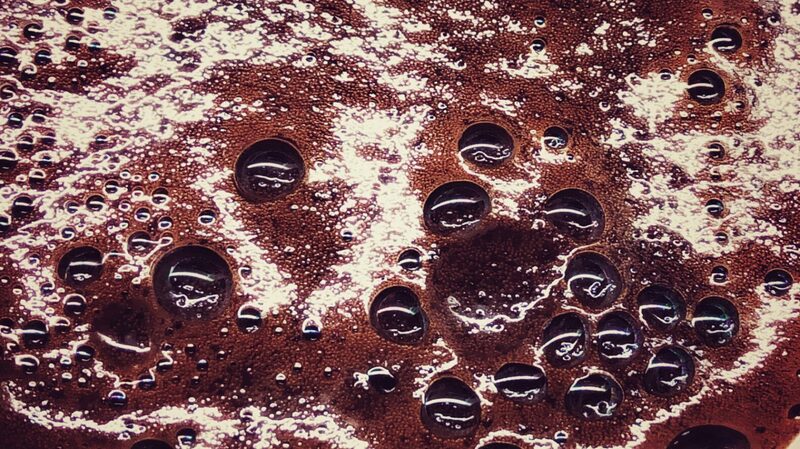 I have no idea why my ground coffee looks like this – with bubbles about to pop. It would probably help to stir it and let the grounds sink but I make a point of never stirring my coffee. It’s a waste of a clean spoon. Waste of a clean spoon, we are alike in that! How do you make your ground coffee? In a percolator? I’m old school. I drink so much coffee that I can’t afford to make too much fuss about it or I would spend my whole life with coffee preparation. I just boil water in the kettle and pour it over fresh ground coffee in a mug. Then I don’t stir, I blow on the surface to make the grounds sink a bit. That’s the traditional way coffee has been made in this part of the world forever. It’s not the best way for sure, but I’m used to it. Are you cooking something weird ?